Stella McCartney is one of those designers who just has it. It’s hard to say exactly what it is, but we know that this designer always manages to deliver something amazing when you least expect. Stella McCartney’s style is to question the status quo of gender styles and deliver style that is fresh and challenging in concept and design. In this article we look how you can get the latest Stella McCartney look in your wardrobe. It’s hard to but effortlessly put together, especially when you are running a business or working hard in your career. We always talk about planning your outfits and how best to approach your wardrobe with key pieces. The same approach can be taken with Stella McCartney. Investing in key pieces in each season mean you get lots of potential outfits to suit all occasions. A great item can be a chic jacket that is timeless yet still edgy. The jacket in this particular look has wide shoulders and a loose fitting, but tailed body with the cinched in waste detail. We think the bodice like detail and metal clasps give a timeless almost historical look to the jacket. This jacket could be work for work or with skinny jeans and heels with the sleeves rolled back for a relaxed, evening look. Go daring with no top underneath or simply wear with a light, chiffon blouse. A key theme with any Stella McCartney are the neutral, almost passive tones. Neutral tones in this outfit don’t create a washed out effect, it creates a sense of solidarity- challenges the conventions that you need bright tones to convey personality. Culottes are the perfect blend of trousers and a loose, maxi skirt. The silk culottes seen in this picture are 100% so perfectly breathable and free flowing. 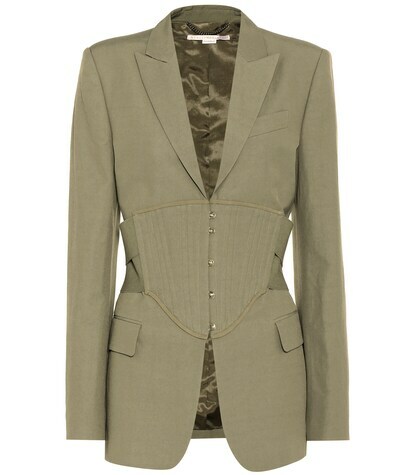 When paired with the jacket they provide a contrast statement to the cinched in waist of the jacket. The agenda of modern women is woven throughout this outfit, the long flowing trousers present sensation of upwards mobility and freedom, whilst the jacket reminds of the structured gender world that is being challenged. Traditional materials can be combined in unusual, and surprising ways to create something new. The use of chains and metal with neutral tones materials makes a striking contrast- much like this shoulder handbag. Go bold and different (but still practical- lots of space for the everyday woman’s essentials!) 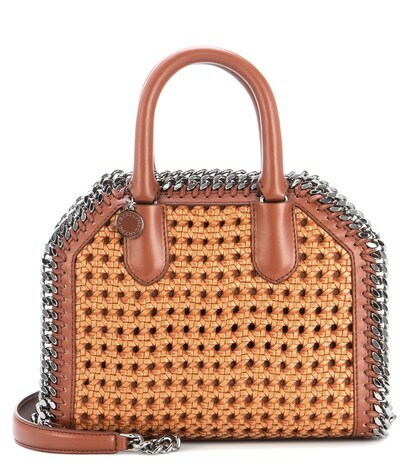 with this almost punk-ish bag by Stella McCartney. As with all fashion- wear it with pride and confidence. When you wear an outfit with confidence the clothes become you. Any of these items can be worn with other items but together, this outfit makes a special statement, there is more than meets the eye.